One of my favorite parts of blogging is the emails/comments ya'll send me. For two reasons. #1: Although I'm usually pretty outgoing, I'm a big introvert at heart, and sometimes wearing XXL sweatpants and hiding under my bed sounds like a fine way to spend the day. But, then I read your emails, and I'm reminded of how much I love blogging and why I can't just live under my bed in sweatpants. Basically, your emails prevent me from becoming Gollum. Reason #2: Your emails are filled with tons of great questions, which really helps me out when I'm trying to figure out what topics I want to write about. 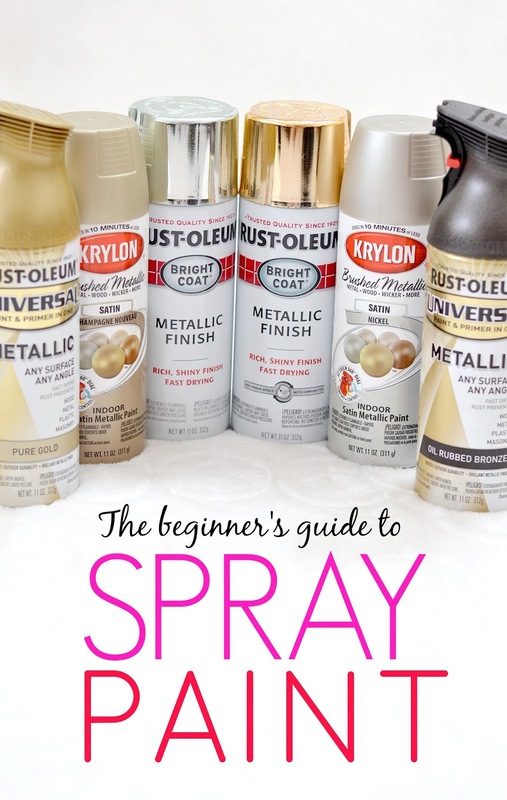 So, today I thought I would tackle one of the topics you ask me about the most: spray paint. And that's how we transition from Gollum to spray paint. You saw it here first, folks. 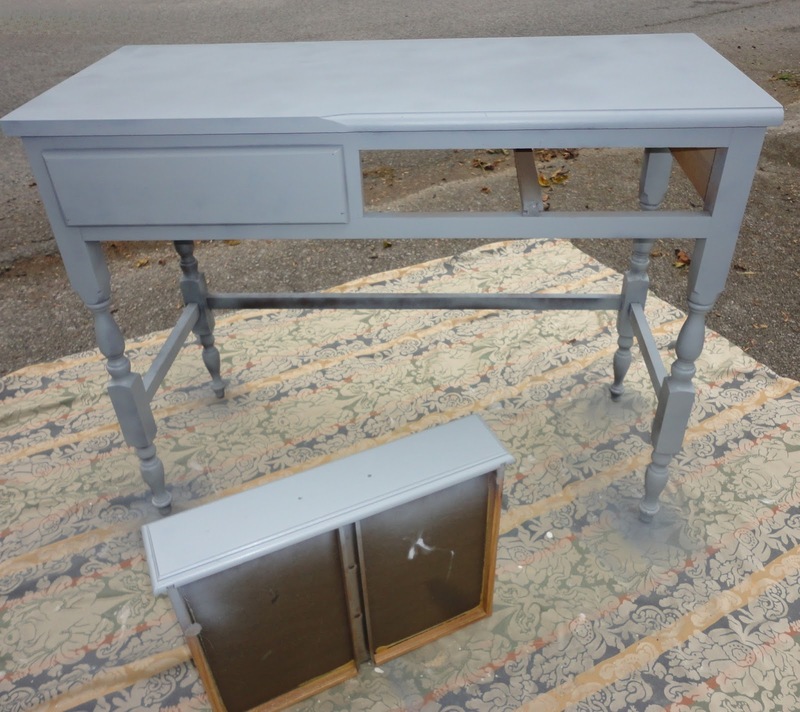 I began using spray paint around the same time I started decorating our house with thrift store finds, and I quickly learned that just about anything can be updated with a coat of spray paint. 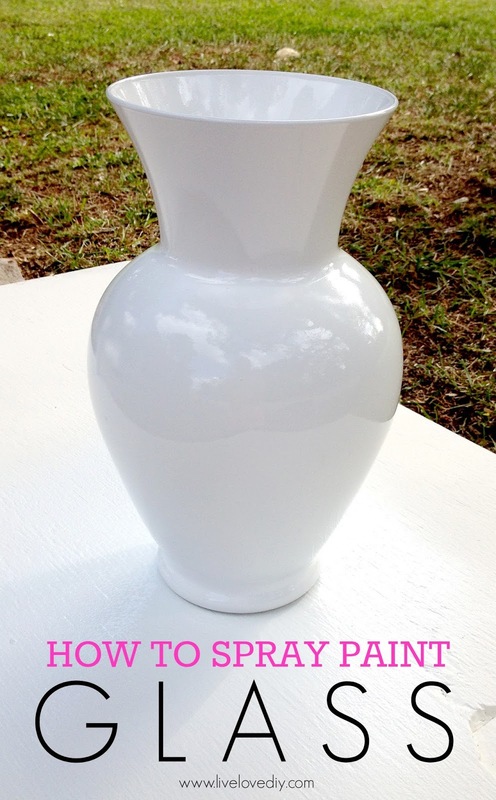 And ever since sharing this post last year, I've been getting tons of questions about spray paint. Hopefully today's post will help answer some of those questions! So, let's get started. Here are the top 10 questions you guys ask me about spray paint. 1. Why choose spray paint? There are so many pros when it comes to spray paint. Just to name a few, spray paint provides more coverage (with no brush strokes) and dries much faster than paint out of a can. It's oil based, and adheres really well to almost anything, and it's much more durable than latex paint. And of course the best part about spray paint...it's easy and fast, and there's barely any cleanup. Basically, it's one of life's most precious gifts. The cons of spray paint, in my opinion, are as follows: Color choices are very limited (when compared to the infinite possibilities of traditional paint) and it's more expensive per square foot of coverage. Also, it's smelly and you have to use it outdoors in a well-ventilated area and wear a mask. 2. 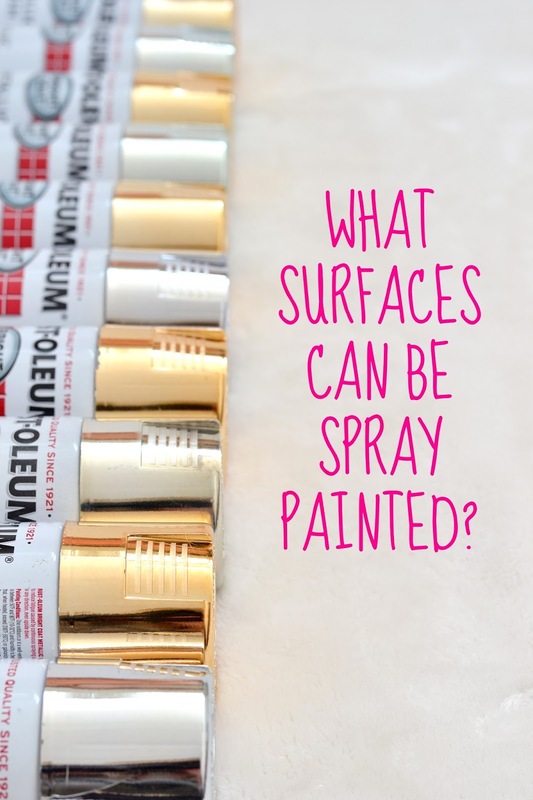 What surfaces can be spray painted? Spray paint is super versatile and can be used on tons of different surfaces, for example: wood, plastic, metal, fiberglass, tin, ceramic, mirror, glass, masonry, plaster, concrete, terra cotta, canvas, MDF, laminate, and particle board. You can use spray paint on most items used for decorative purposes, but it shouldn't be used on surfaces that comes into contact with food or beverages. So don't spray paint your fork. 3. What are the basic spray painting techniques? Spray painting is pretty easy, but here are the basics to get you started. Go outside in a well ventilated area. Wear a paint respirator. Wave at the neighbors who look at you like you've escaped from the set of Breaking Bad. Shake the spray paint can for a few minutes. Aim the can away from the item you're painting, push down the nozzle, and start the stream of spray paint. The first spray out of the can usually spatters and you won't want that spatter on your item. 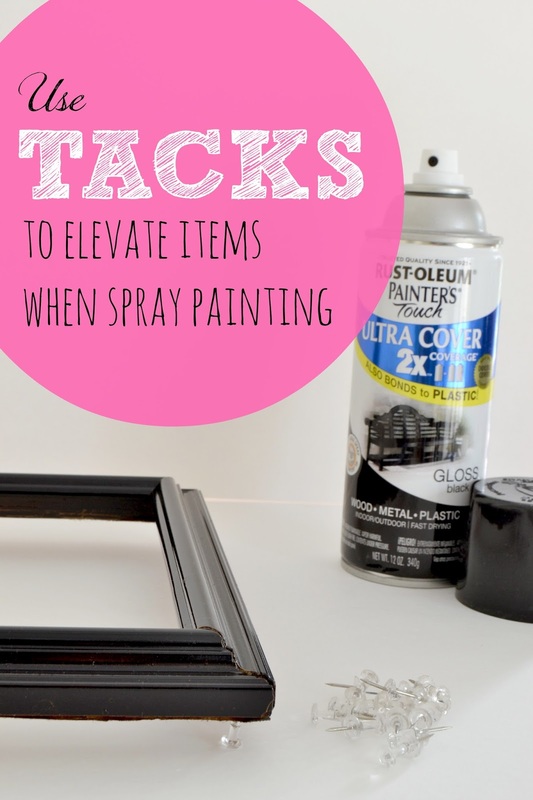 Move the stream of paint onto your item, keeping it about 6-8 inches away, and move back and forth in a smooth, rapid motion, spraying it from every angle. When spray painting outside, I often put my items on a big piece of cardboard that I can rotate without having to touch the item. Apply 2-3 very light coats of spray paint, allowing each coat to completely dry in between. If you apply the paint too heavy, it will drip. If you don't allow the coats to dry in between, the paint will bubble. So, just remember...several light coats + allowing paint to fully dry in between coats = perfect paint job. 4. Can spray paint be used in any temperature? 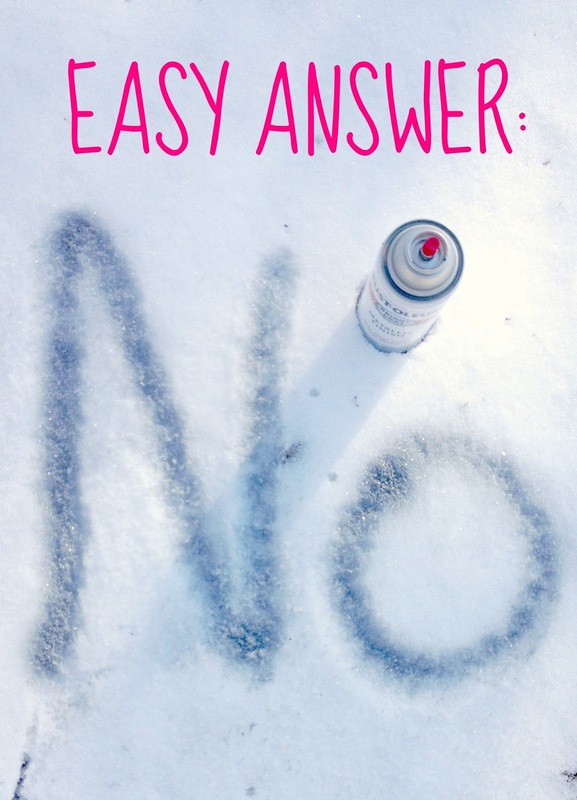 Spray paint doesn't work well in very cold weather. Trust me. I've tried it. We don't park in the garage though, so I can use the garage for spray painting during the winter. I usually set up a large box or garment bag to create a spray painting tent and prevent any overspray. It's best to spray paint in temperatures above 50 degrees. Anything below that, and your paint is going to crack all over the place and make you very, very sad. 5. Do I need to sand before I spray paint? Not always. This one is kind of a judgement call. I never sand small decorative items. I just spray paint them and call it a day. But, sometimes when I spray paint small furniture, I might scuff it lightly with some fine grit and then prime it first before spray painting. 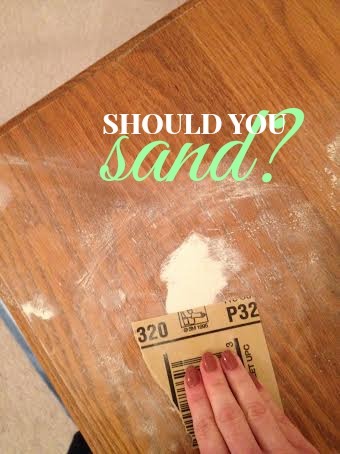 Also, if there is any old varnish or if something needs smoothed out on a piece of furniture, sanding can provide you with a fresh start. So, small items = no. Furniture = It's up to you, girl. 6. Should I prime before painting? I rarely prime anything unless it's furniture, something really glossy, or if it's going to go outdoors. 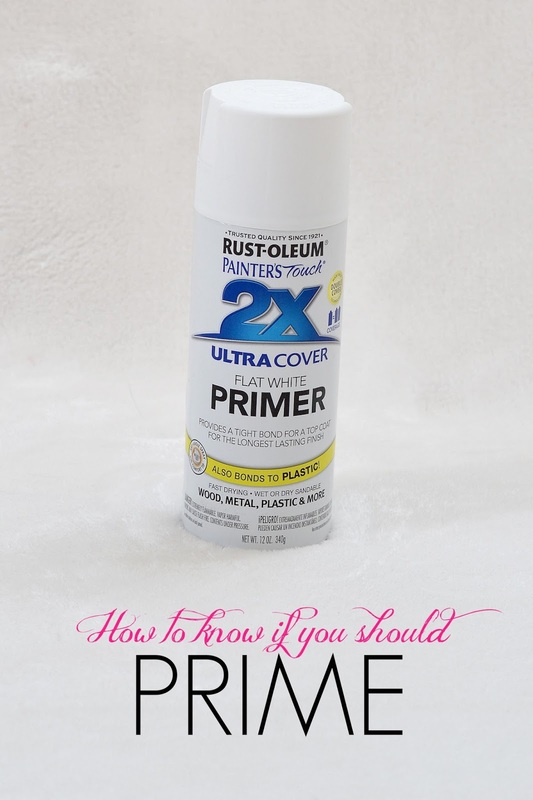 In my experience, although primer is supposed to help with durability and adhesion, I don't find it necessary on most items. Spray paint is oil based, so it adheres really well on its own. 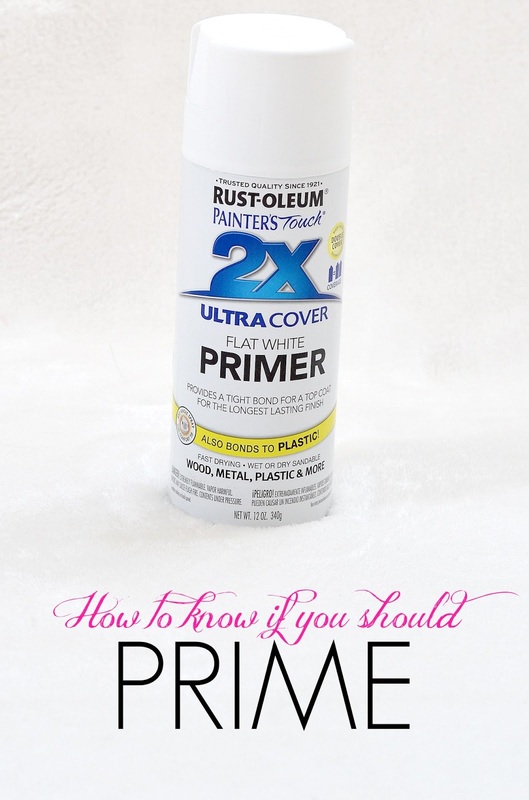 Although, if you're in doubt, it can't hurt to prime. Primer sidenote: If you're ever looking for a really pretty flat gray spray paint with blue undertones, just use basic gray primer. Remember that one time when I discovered the awesomeness of gray primer...and then temporarily ruined that desk with what followed? 7. Do I have to use a topcoat/clearcoat after spray painting? I rarely ever use a topcoat when spray painting. Mostly because the majority of the items I spray paint are smaller decorative items, not furniture, and the spray paint alone provides enough durability. 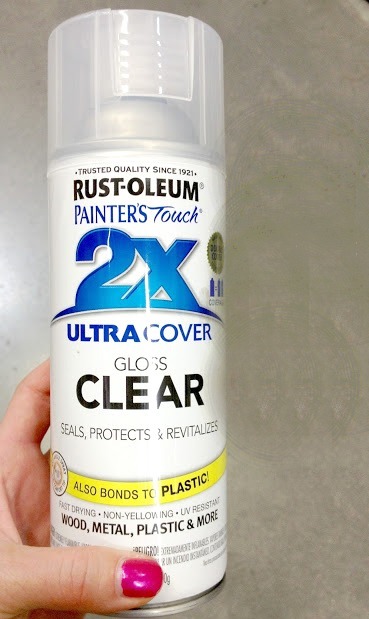 If you are spray painting furniture and find that you just really want an extra layer of durability, I recommend using Rust-Oleum Clear Gloss Spray Paint (affiliate link). It can also be used over flat spray paint to make it glossy. 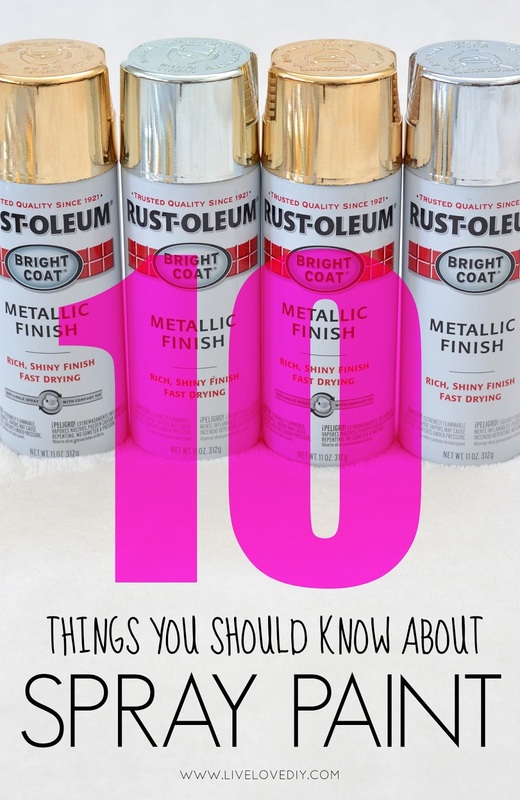 But, really, you don't usually need a topcoat for spray paint. 8. 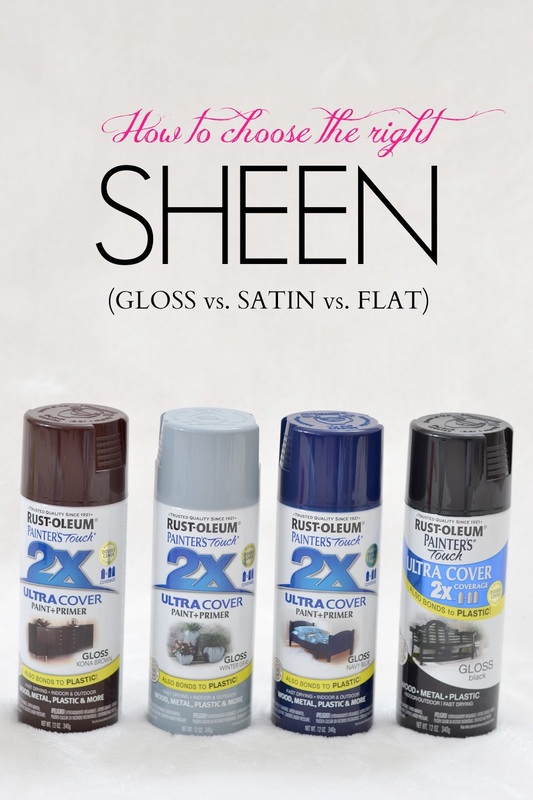 How do I choose a sheen? Some colors of spray paint are offered in different finishes, usually flat, satin, semi-gloss, and gloss. Basically the only difference is how shiny they are. You can tell by the lid on the can what the finish will look like. unlike that little square on top of every single box of hair dye ever. 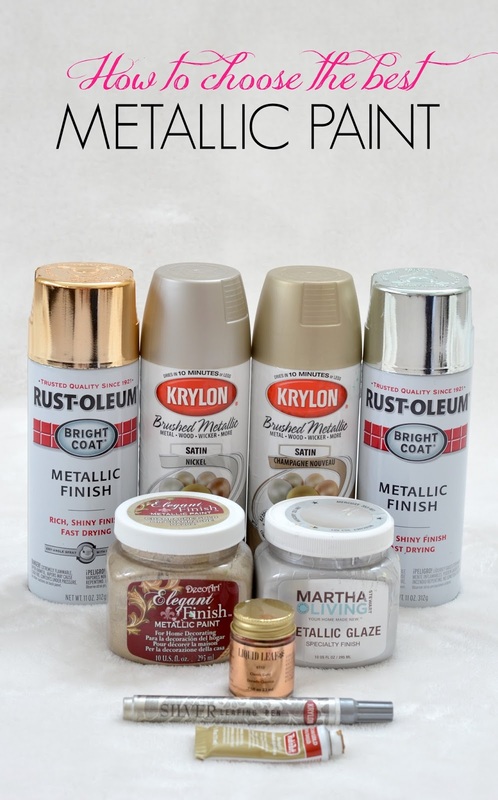 I mostly use metallic spray paint, but if I am using a color (like some of the ones pictured above) I almost always use semi-gloss or gloss spray paint. I just love the way it turns out, and it's a really durable finish. I also love using high gloss white to make stuff look like ceramic. You may remember in my last paint secrets post when I talked about spray painting glass to look like ceramic. 9. Are any of the spray paint accessories worth buying? 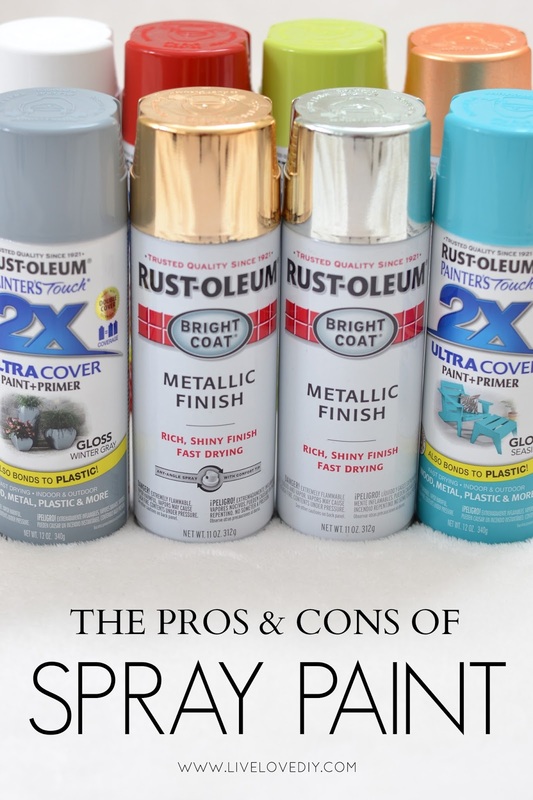 I don't use primer very much, or topcoats, but there are a few other products out there that are totally worth buying because they actually make spray painting easier. 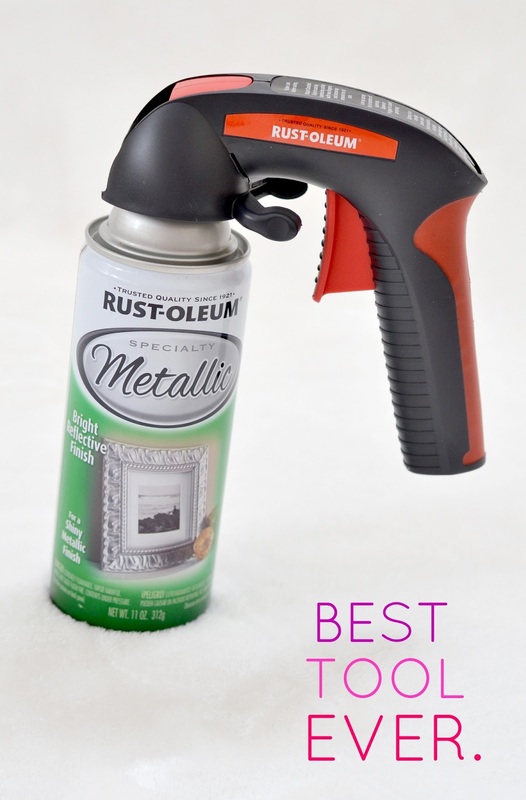 My favorite is the spray paint handle (affiliate link). I get much better results when using a a spray paint handle than I do when using my bare hand. I don't use it every single time, but if you are spray painting something large (like a piece of furniture), the handle makes it a lot easier. Although the manhands look strong, they are very dainty indeed. 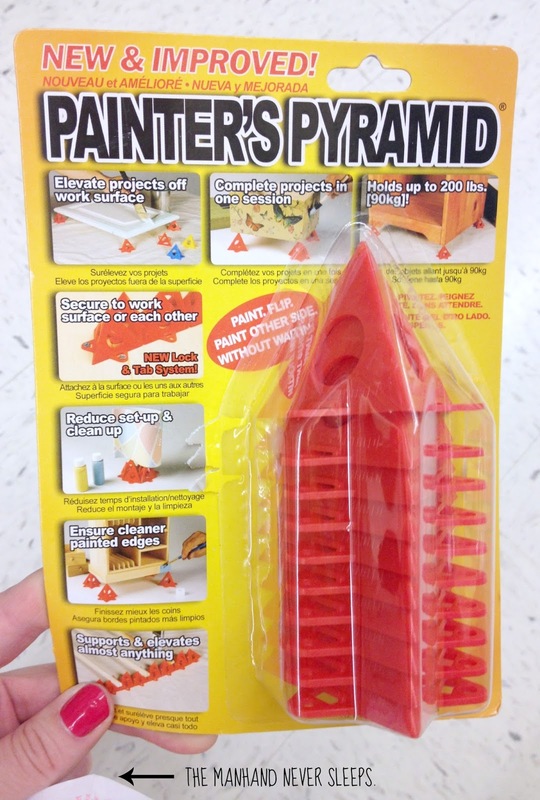 Another product I recently found are these little painter's pyramids. They apparently hold up to 200 lbs and elevate your item while you spray paint. I say 'apparently' because I have yet to try them out, but I though they looked like a pretty cool idea. OR...if you're cheap like me, you can also use tacks to elevate your projects. I do this a lot, especially when painting frames. I don't think tacks can hold up to 200 lbs., but I have yet to test my theory. 10. What are your favorite paints? Last but not least, let's talk about my favorite paints. There are tons of different brands of spray paint on the market, and I'm pretty sure I've tried them all. Or at least most. The ones I like the best are Rust-Oleum and Krylon. They're affordable, the colors are great, and the quality is usually pretty consistent. I use the metallic colors the most, and the ones in the below picture are my favorite. You can find any of these on Amazon using the above affiliate links. Here are a few examples of where I've used each one in our house. 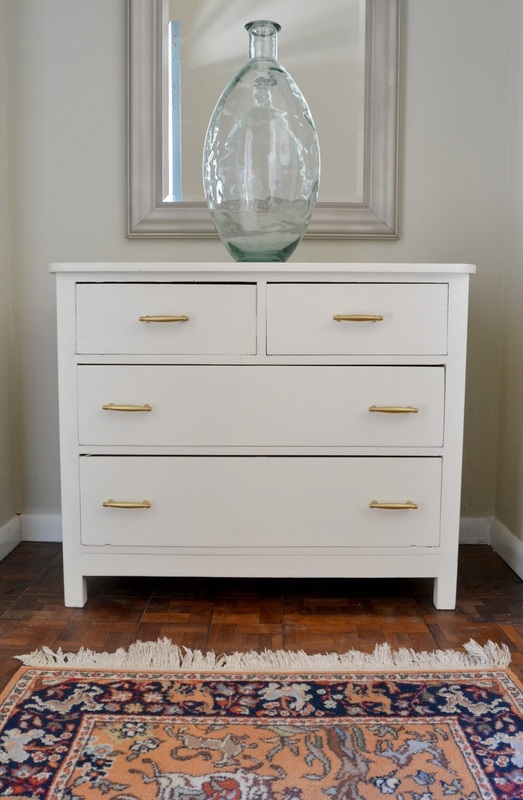 In our entryway pictured below, I used the Krylon Champagne Nouveau on the mirror and Rustoleum Bright Coat Gold on the dresser hardware. 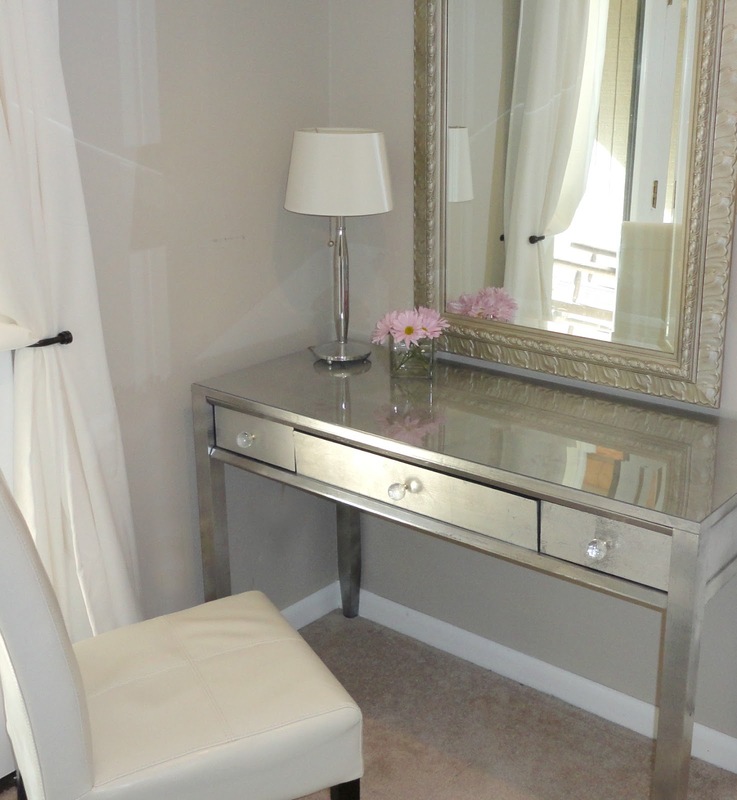 In our master bedroom, I used the Krylon Satin Nickel on the mirror frame and on the base of the lucite lamp. 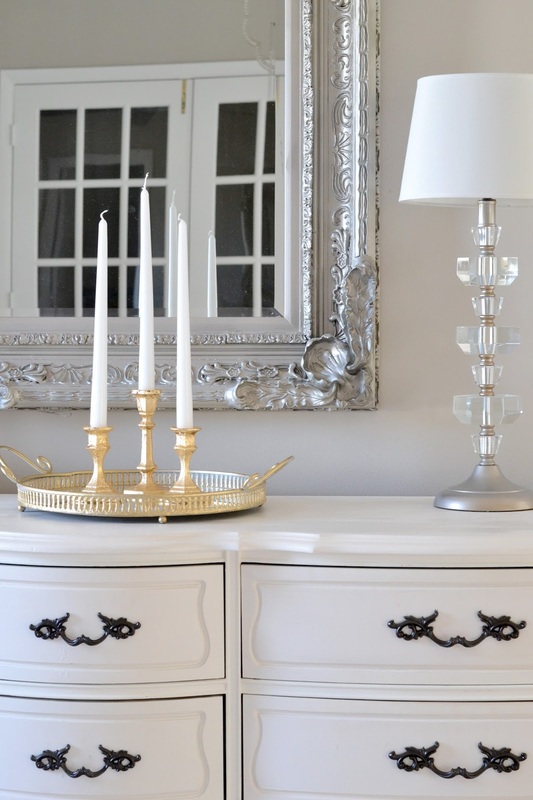 I used Rustoleum Oil Rubbed Bronze on the dresser handles, and Rustoleum Bright Coat Gold on the mirrored tray. I actually gold leafed those candlesticks (which were originally the clear glass kind from the dollar store) and then Cheese kept knocking them over. And then I crammed them in a closet somewhere. And then I never thought about them ever again. CATS. I used Krylon Champagne Nouveau on that mirror on the rock wall. I think I've been asked about what color I used on that mirror more than any other questions I've ever gotten. In the master bedroom side room, I used the Rustoleum Bright Coat Gold on Vern's hardware, Rustoleum Bright Coat Silver on the planter, and Krylon Satin Nickel on the mirror. My poor plant has one leaf left, guys. I tried everything, including mouth to mouth. 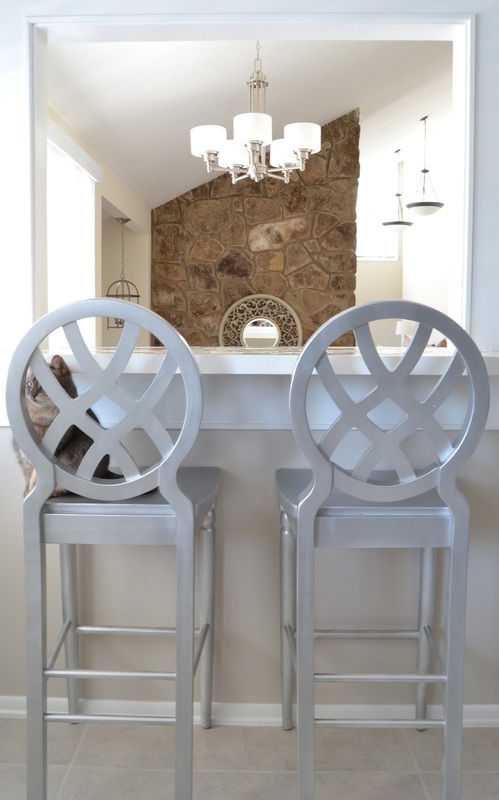 On our barstools in the kitchen, I used Rustoleum Universal Titanium Silver. I didn't have a can on hand, so it's not pictured in that first picture, but it's one of my favorites. 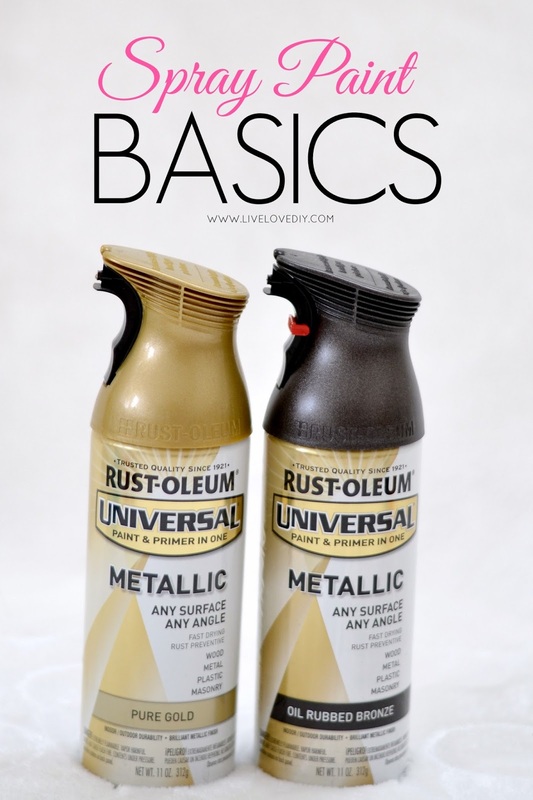 The Rustoleum Universal spray paints are the most expensive, but you totally get what you pay for. Those barstools get more use than just about anything in our house, and they have held up perfectly for more than a year. And there's Tootie, showing off one of her many talents: hiding in plain sight. 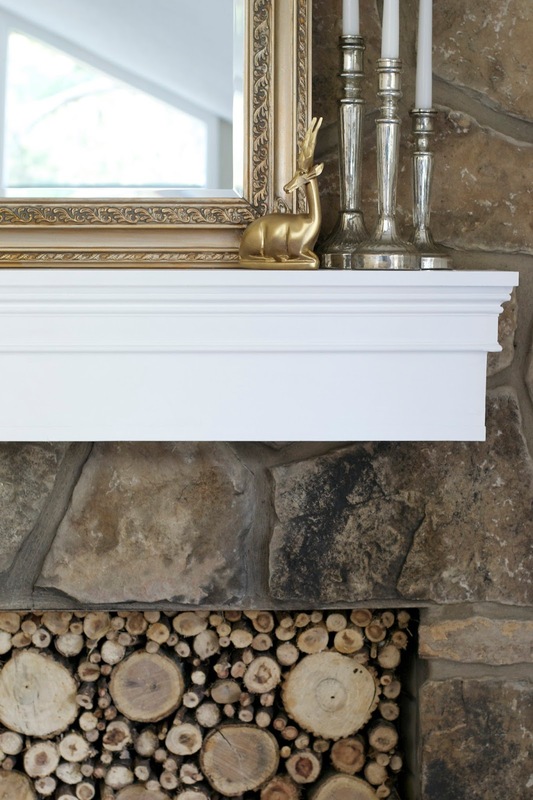 On the mantel, I used Rustoleum Bright Coat Gold on the little wooden thrift store deer, and I also used it on the mirror frame and then sponge brushed a little bit of silver metallic craft paint over the top of the gold spray paint. 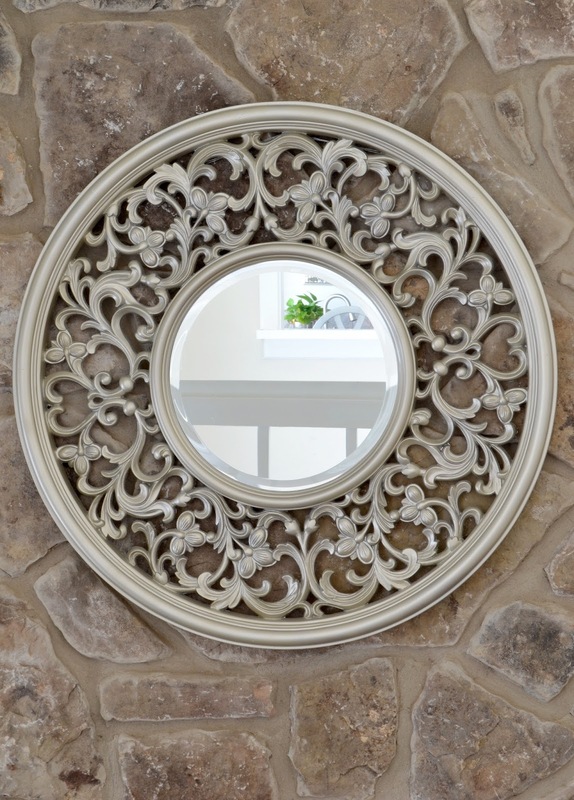 And finally, in the picture below, I used Krylon Champagne Nouveau on the mirror. On the vanity, I used actual silver leaf on the drawers and top, but used Rustoleum Bright Coat Silver on the sides and legs. Many of you have asked since that project if I think it would have turned out just as good if I only used the spray paint (since the silver leaf was a nightmare), and my answer is yes, yes it would have. And that, dear sweet friends, is all for today. I'll be back soon to share one of my favorite projects, the bedroom reveal, and the craziest thing ever. And I mean ever. Now congratulate yourself on a job well done. You just made it through the longest post known to mankind. P.S. Oh yeah, and if you still haven't had your fill of spray paint talk, go here.